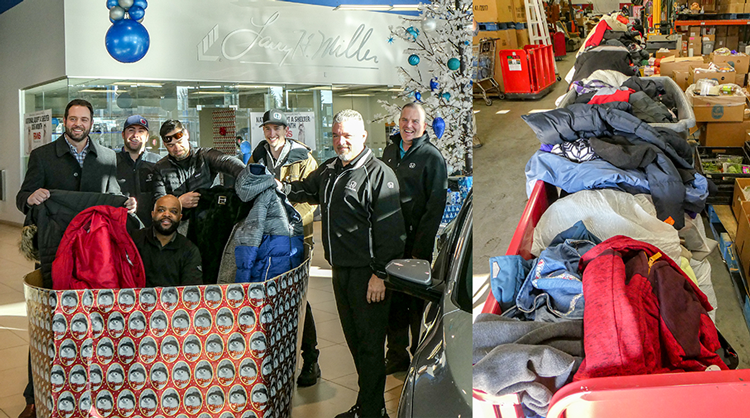 Thank you to our employees and customers in Boise for allowing us to donate more than 250 coats to the Boise Rescue Mission! These coats help keep homeless women, men and children in the Treasure Valley warm this winter. Representatives from Larry H. Miller Dealerships ' four stores in Boise will present $10,000 each to Sleep in Heavenly Peace and the National Kidney Foundation of Idaho on October 12 to benefit children's programs. "We're so fortunate to be able to enrich the lives of the individuals in our community through charitable giving," said Chad Bravender, general manager, Larry H. Miller Honda Boise. "Our incredible employees, who donate each month to Larry H. Miller Charities, allow us to support vital programs that are making an impact. Sleep in Heavenly Peace and the National Kidney Foundation are doing great work in our community providing programs that are greatly enhancing the lives of local children." The $10,000 donation to the National Kidney Foundation will allow 16 Idaho pediatric kidney transplant recipients to attend Youth Transplant Kamp (YTK), the only youth camp in the Idaho region that serves children ages 8-18 with heart, liver, lung and kidney transplants. YTK is designed to help these children regain their sense of independence, confidence, self-esteem and hope. Employees from four Larry H. Miller dealerships presented a total of $15,000 in donations to two Boise nonprofits on Wednesday, January 10. Girl Scouts of Silver Sage received a donation of $5,000 to use towards their Outdoor Program, which offers year-round recreational opportunities that allow girls to explore leadership, improve skills and engage in environmental stewardship. The Salvation Army of Boise was presented with a donation of $10,000 for their Booth Marian Pritchett School Program for Pregnant and Parenting Teens. The goal of this program is to help teen parents achieve success by staying in school and graduating. "Parenthood is the leading cause of school dropout among teen girls, with 70 percent of teenage girls who give birth dropping out of school. The consequences of this can be devastating," said Hillary Betz, donor relations director, The Salvation Army of Boise. "Our program serves both girls and boys, with the average age of 16. In partnership with the Boise School District, we provide these teens with academic, parenting, life skills and on-site child care resources in an effort to ensure their academic success." Larry H. Miller Dealerships Aims to Keep Homeless Warm This Winter With Annual "Driving for Coats"
Employees from Larry H. Miller Honda, Larry H. Miller Chrysler Jeep Dodge Ram, Larry H. Miller Subaru and Larry H. Miller Used Car Supermarket collected coats for the Boise Rescue Mission during their 9th Annual Driving for Coats campaign. New and gently used coats of all sizes were collected for both adults and children to stay warm during the winter months. Boise Rescue Mission provides shelter to more than 400 homeless individuals and families each night. help warm those in need this winter. "We are giving away a lot of warm coats right now, so this gift is not only a wonderful gesture but is urgently needed," said Rev. Bill Roscoe, president/CEO, Boise Rescue Mission. Employees of Larry H. Miller Dealerships' four Boise locations presented a donation to United Way of Treasure Valley's Basic Needs Hygiene Kits for Homeless Students project on September 7. These kits provide a one-month supply of basic hygiene items, such as toothpaste, deodorant, soap, laundry detergent and feminine hygiene items to homeless students. "In Boise alone, nearly 900 students are homeless and do not have a safe, permanent place to sleep or supplies to bathe or stay clean. In spite of this, these students are fighting to stay in school, graduate and succeed," said Nora Carpenter, president and CEO, United Way of Treasure Valley. "We work with school district social workers and homeless student liaisons to help keep these vulnerable kids in school by providing them with basic hygiene kits. To date, more than 4,500 kits have been distributed thanks to volunteers and donations from organizations like Larry H. Miller Dealerships." Funding is via Larry H. Miller Charities, the charitable arm of the dealership group, which is made up largely of employee contributions. Our General Manager, Chad Bravender, was present to deliver our donation to the Idaho Diabetes Youth Programs. We are always honored to be able to give back to our community, and thanks to our Boise employees who contribute to a group charity fund, we are able to once again support our friends of the Idaho Diabetes Youth Programs with a contribution. Larry H. Miller himself left a legacy of making a difference in the lives of others, and we always hope to do just that through worthy organizations such as this one. Every year to commemorate our founders' birthday, employees all across the Larry H. Miller Group donate their time and effort to benefit those in their respective communities. This year, Larry H. Miller Honda Boise was proud to be a part of a building project for the Boise Valley Habitat for Humanity. Such a great cause that we were thrilled to participate in. Larry H. Miller, who passed away in 2009, strongly supported giving back in the communities where he did business, and lived by the philosophy to "Go about doing good until there is too much good in the world." "I feel that it is very important to support the communities where we live, thrive and conduct business," said Gail Miller, owner of the Larry H. Miller Group of Companies. "Our annual day of service enables us to share meaningful experiences with fellow employees and make a difference in communities across the west." We were proud to help set up the Wild West Auction, an annual fundraiser for the Ada County Boys and Girls Clubs.